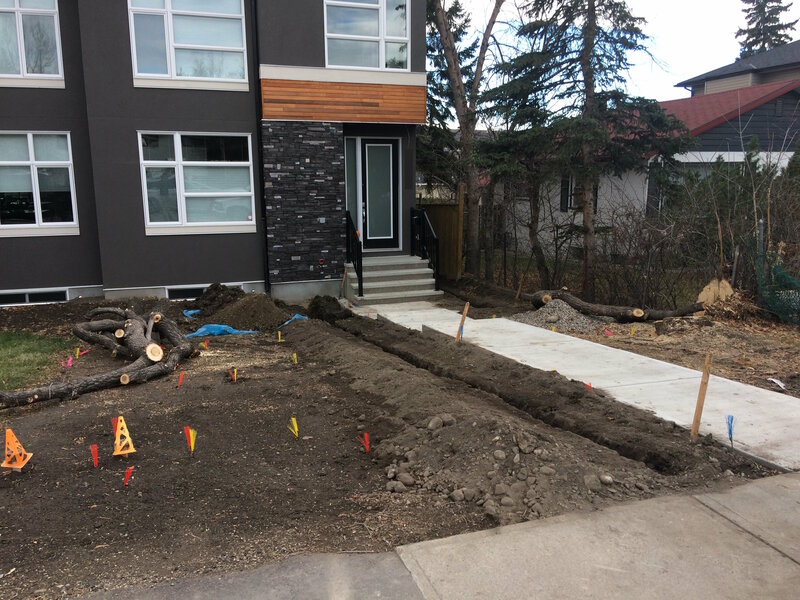 We have a client with a redeveloped lot in NW Calgary that is a particularly challenging site in terms of grading and water flow. The overall slope of the property is downhill from the front of the property to the rear of the property. There is a fairly steep slope down from the front sidewalk, toward a newly built duplex, which continues at a gradual slope to the rear alley. 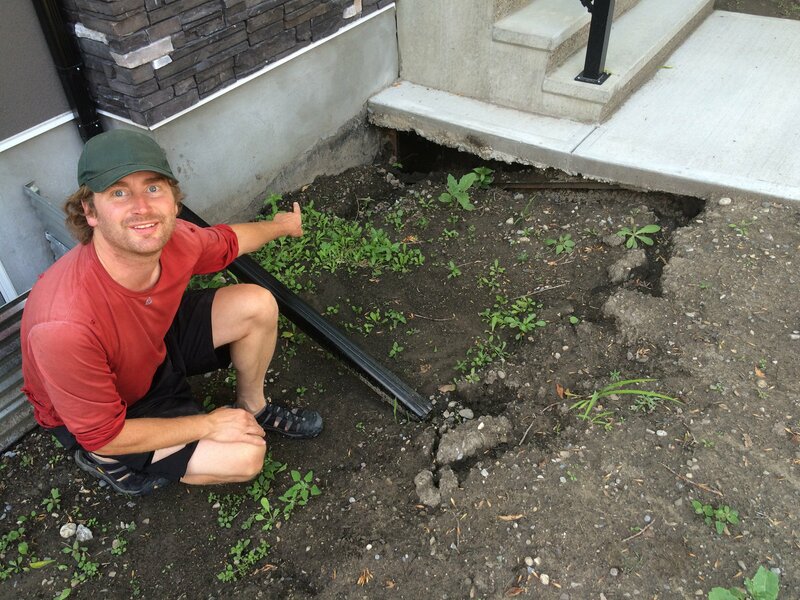 As a result, water flowing from the downspouts on the front of the house was not able to make it away from the house and created a large sinkhole under the front concrete steps (over half a meter deep! ), with potential to have damaging impacts to the foundation of the house over time. Our design strategy was to create a hydrostatic system (construction photograph shown here). Under summer conditions, water flows into a PVC pipe that is buried into the slope of the front yard and emerges at the top of the property near the front sidewalk in a neat little water temple built of stacked rocks. How do you seemingly move water uphill? The key is to ensure that the inflow of the system is at a higher elevation than the outflow, which results in enough hydraulic head to drive the water through the system to the uphill outflow. Water at the top of the property is then slowed and infiltrated through a series of cascading basins that are planted with a perennial food forest. Once water reaches the lowest basin, it is directed into a lined drainage trench that runs under the existing private sidewalk via a culvert and around the side of the house. All of this took time, effort, and expense, and is an example of why you should avoid “Type 1 Errors” in the first place! 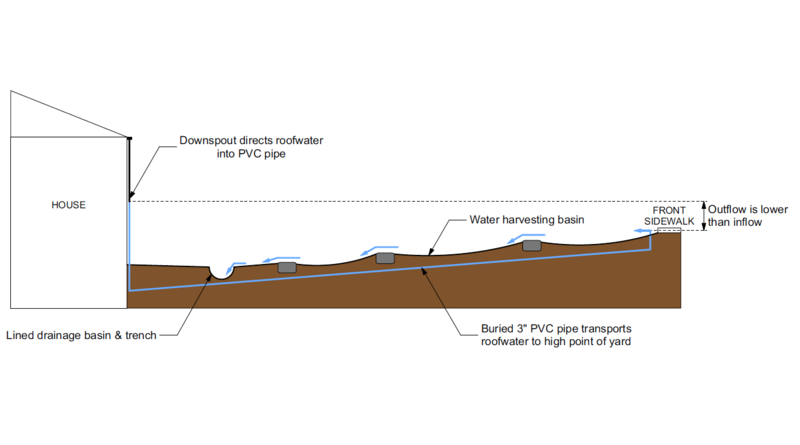 The diagrams below show a simplified version of the plan and cross-section view of the design, under summer flow conditions. The result is a water harvesting landscape that does not impact the foundation of the house. Another example of turning a problem into a solution! The front yard is planted with a combination of edible perennials and expressly aesthetic plants that create curb appeal, including Norland Apple, Romeo Cherry, Evan’s Cherry, Honeyberry, Gooseberry, Currant, and Jostaberry, along with over 50 different species of herbaceous perennials. 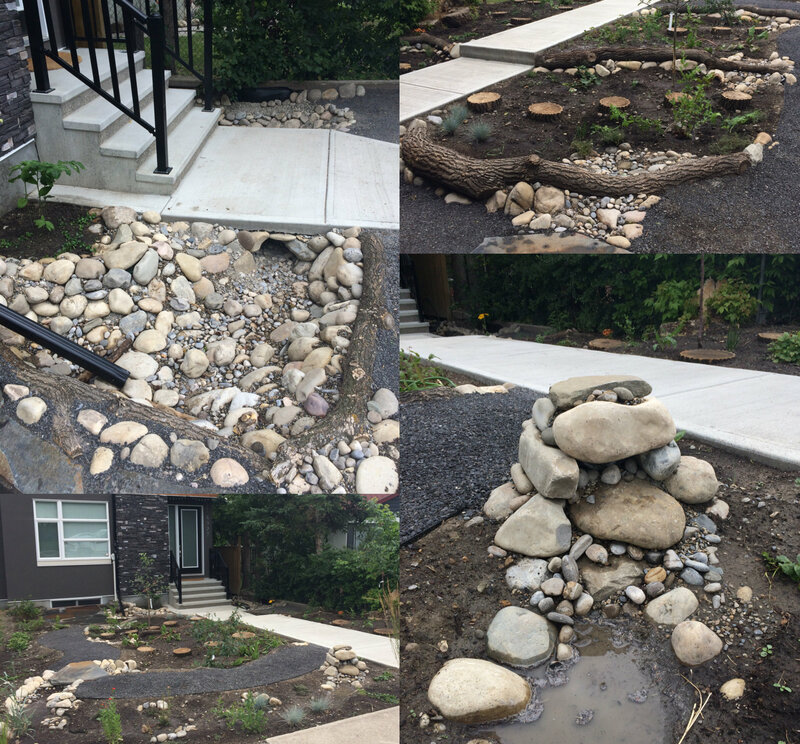 The photos below show the yard shortly after installation in late summer 2017. Because these photos were taken just after installation, they don’t yet show the cover crop of Crimson Clover that was sown into the bare patches of soil. Using a cover crop and planning an extensive ground cover layer will further expand the water harvesting potential of the space by slowing evaporation, but we’ll have more on that topic in an upcoming newsletter! A final note about water, for now, as we are in the midst of winter. It’s always important to plan a winter path when designing any type of water system, and to have a winterization strategy for the system. Drain all of the water from the pipes before freezing, and do not direct water into underground pipes in the winter, as this can create breaks in the pipes when water freezes and expands. Also, make sure you take into consideration your climate’s unique characteristics, in our case in Calgary we have the Chinooks which cause periods of intense melting and freezing. 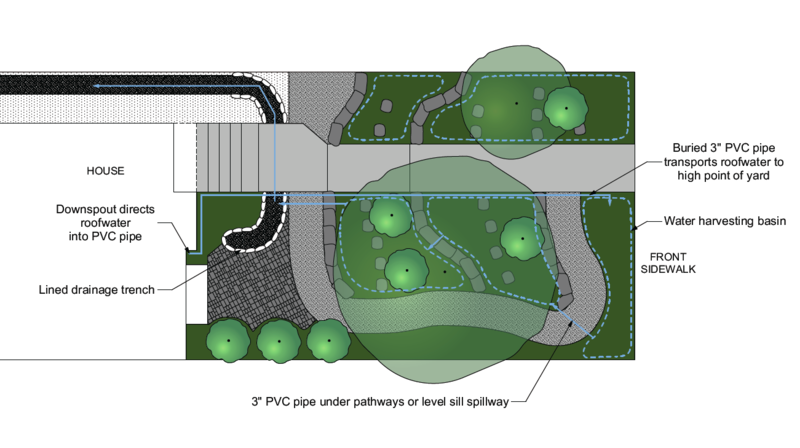 In this project, the winter downspout goes directly into the lined drainage trench so it is able to flow overland in the winter via the culvert under the existing private sidewalk which is sized to accommodate Chinook periods of melting. Want to know more? We have a weekend course coming up in February! The project described above is just a taste of what can be accomplished when you design with ecology in mind. Over the years, as the food forest (aka, edible forest garden) matures and grows, it will benefit from its access to additional roof water that was designed into the system. And this client will have a diverse, beautiful, healthy source of locally grown perennial food. We are passionate about creating regenerative habitats and growing local food, and we know that you are as well! 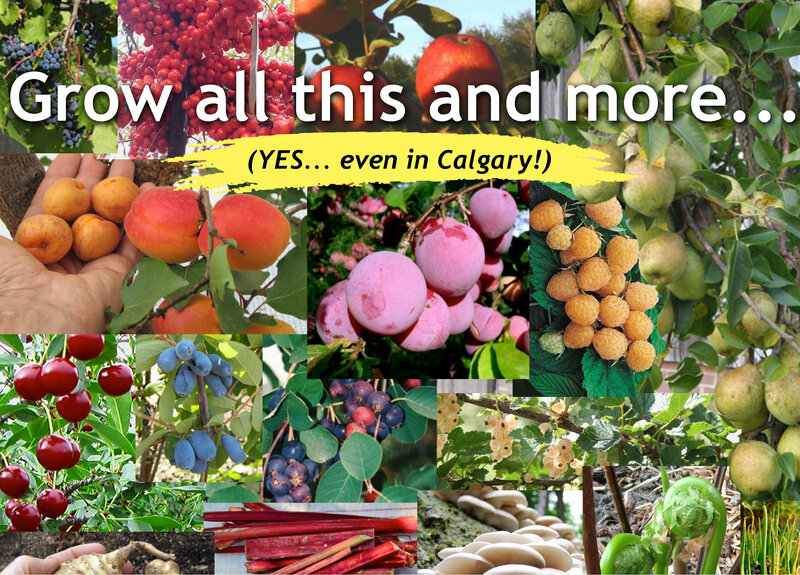 We are very pleased to be offering our Design and Plant Your Edible Forest Garden course on February 24 to 25 right here in Calgary! In addition to water, we will be covering the concepts of overall visioning and design, plant community design, plant establishment, and more, as they relate to edible forest gardening in our Calgary climate. We have taken the best of our collective knowledge about how to effectively design and plant a food forest, and distilled it into two days of teaching and interactive activities that will demystify the process and give you the skills and knowledge to take your ideas to fruition. We will go through the design process step by step and give our tips on how to get started the right way. Students in all of our weekend workshops get to practice their design skills on a real project to be implemented in their area – for this workshop we will be designing a patio space for Ol’ Beautiful Brewing Company’s new brewery location in Inglewood. We’ve extended our Early Bird price to January 31, so don’t delay and reserve your spot now! For detailed information on the course, please see the Course Page of our website. If you have questions about the course, please feel free to Contact Us. And if you’re all ready to go, tickets can be Purchased Online! Have an interest in expanding your knowledge and learning? Prairie Sage Permaculture and reGenerate Design have partnered to pass along savings to you! Sign up for Design and Plant Your Edible Forest Garden on February 24 & 25, and either of Prairie Sage’s upcoming courses – Green Babies on February 10 or Introduction to Permaculture on May 5 & 6 and you’ll receive 20% off on BOTH courses! Email either reGenerate Design or Prairie Sage Permaculture for discount codes and details prior to purchase. Here in Alberta, we’re familiar with the Wild Rose as a common native species and also our provincial flower. It’s a deciduous shrub that will grow between 1m to 3m in height, with thorny stems, pretty pink flowers, and pear to ovoid-shaped hips. The hips are edible, even in winter when they are sweet and fleshy, and contain high amounts of vitamin C, vitamin A, and dietary fibre, among many other nutrients. In some cases, the hips may have dried out on the shrub; these ones are still great to use in tea. 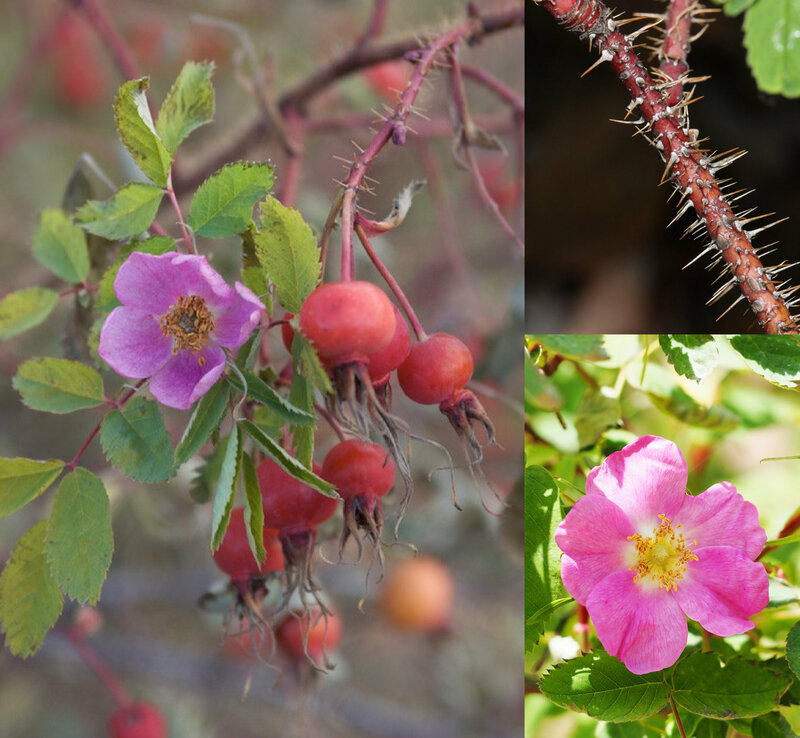 The next time you’re taking a winter walk, try out a Wild Rose hip. Take note that Wild Rose will send suckers and spread, but if you have the space, or you’re willing to chop and drop, this is a great plant! All the best and hoping everyone has a fruitful start to 2018!